Chandler Ault will forgive you if you haven't heard of him. This spring, he was only the No. 84 rated high school javelin thrower in pre-season national rankings. But in the span of a year, the Michigan native has improved his best more than 40 feet, from 174-4 to 215-7 to rank No. 4 in the United States. Today at the AAU Junior Olympic Games in Ypsilanti, Michigan, he threw the second-farthest mark of his career -- 210-0/64.02m -- to win his first AAU national championship title. It goes well with the USATF Junior Olympic title he won last week in Lawrence, Kansas. "In the past two weeks, I've just mentally prepared and made sure I was nice and loose going into the meets," he said after the awards ceremony. "And also just focusing on speed throughout the throw has really helped me in the last few weeks to add on 10 feet. "Here, I was just trying to have some fun," he said of the day's event at Rynearson Stadium on Eastern Michigan's campus. "I got the crowd going and clapping, so it was more about the experience because I'm from Michigan. I had my home crowd cheering for me. [It was my] first time winning javelin here in AAU, so it was exciting." Ault, who represented Fleet Feet TC today, had never thrown over 200 feet before this year but today recorded three consecutive marks over the barrier to open the competition: 203-11, 207-9 and 206-10 before fouling on his fourth throw. A fifth throw resulted in a 195-2 mark. "I felt a little bit strained in my back on my fifth throw," he said. "Going into my sixth, I was a little nervous and hurt my back a little bit." He overcame the minor back issue to record the second-farthest throw of his career. "My final one, I hit 210 feet, which is a very good throw for me," he said. "A fantastic throw." Ault is homeschooled, but javelin isn't commonly contested at high school state championships anyway, and not in the state of Michigan since the 1930s. Ault broke the unofficial state record in May. Big story I missed: on May 27, home schooler Chandler Ault of Midland broke the 84-yr-old state record in the javelin!!! 2 more big javelin state records for Chandler Ault at USATF JOs: 213-7 & 215-7!!! Now #4 in USA! He found javelin through his success in the discuss and quickly grew enamored of the unusual event. 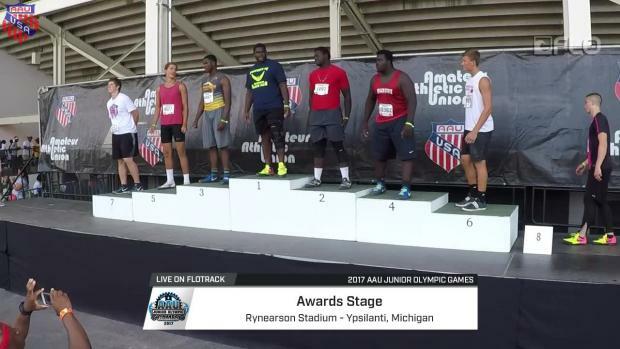 Ault still competes in discus at an elite level and made the podium for 17-18 men here in Ypsilanti yesterday, recording a 153-9/46.86m mark for eighth place overall. Before closing his season, Ault will compete again tomorrow in Grand Rapids, where he hopes to throw for 220 feet. That mark would tie him for No. 2 in the nation behind only Liam Christensen, the No. 8 all-time performer who will attend Stanford next year. 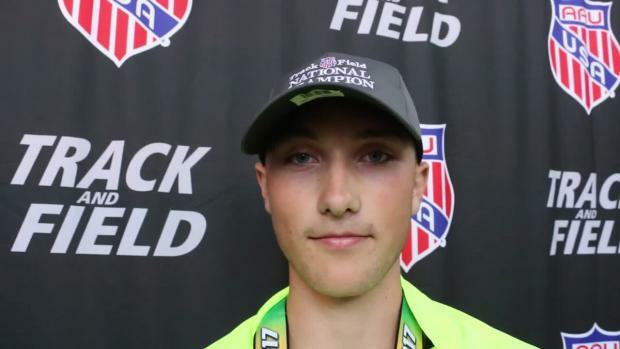 Next year, he hopes to break the meet records at the USATF and AAU Junior Olympic events, the latter of which has stood at 225-7 since 2009, thanks to Sam Humphreys. His college list includes the likes of LSU, Cornell and Central Michigan. "Stick with it, it can be tough," Ault said to young aspiring javelin throwers. "It's very technical but you will hit that breakthrough point. I improved 40 feet this season. If you stick with it and keep working and work on speed and your technique, you'll find your breakthrough moment."